Your heart is racing and you can’t stop it. The sweat is dripping down your brow. The worst is that feeling of doom, like it’s coming for you now and there’s nothing you can do. Panic. It all feels so inescapable. That’s what anxious and panic can feel like for people who suffer from those disorders on a daily basis. Anxiety can feel like a debilitating illness, but it is important to know and remember what it is and what it is not. While it may seem like the walls are closing in, with practice and support, you can get through whatever your anxious feelings throw at you. Let’s look at anxiety first, and then some simple things that you can do to overcome anxious feelings in particular. First, feeling anxious is mostly a physiological reaction. It is what has been hardwired into your nervous system and has helped keep humanity alive when we were fighting for survival against nature. The fight, flight, or freeze part of the nervous activates when you determine there is a threat. When that activates, your body suddenly gets pumped full of adrenalin, and you are in a heightened state of arousal. Your heart is beating fast, you’re sweating, and you feel panic. Does that sound familiar? The psychological aspect of this is what we determine to be a threat. In modern times, there are few tigers or bears thinking we are lunch. Instead, we have upset customers or an angry boss. We have to deal with medical problems. Or we have to get out of our comfort zone and talk to a stranger at a party. These are just some of the things that growing up, we learn can be scary and dangerous. This activates the fight, flight, or freeze system, and we have anxiety and panic. So, you may be wondering, if it is a part of who we are, what can we really do about it? There is a lot that can be done, none of which requires medication or going to a doctor. While that can be helpful, there are other, more natural strategies to try first, that do not require addictive medications. One of the most important things to do is to acknowledge that you are dealing with anxious and panic. That is a major hurdle to overcome for many. Men, for the most part, struggle to admit to being scared, so they may call it other things. Learn to first identify what you are feeling, and acknowledge it. You do not have to accept, it; work to change what you are feeling, but you need to acknowledge that it is real and you are having a problem with it. Now, feelings can be complicated, that much is obvious. We should, and need, to experience the wide variety of emotions there are. As much as painful emotions can be hurtful, they are necessary to heal and grow from the experience. As much as positive feelings need to be experienced fully and cherished, so too must the negative ones be observed. They are, after all, part of what makes us human. Now, looking at what is helpful in order to control anxiety and panic more, the first step is to acknowledge what you are experiencing. This could be part of a daily meditation process. Spending some time every day just being. Find a quiet place, sit comfortably, and just breathe. Pay attention to your body, what it is doing. Let your thoughts drift. Notice them, but do not fight with them. Practicing daily meditation and learning about other mindfulness techniques will be the first step to short circuiting unnecessary anxiety. You may choose to take time every day to practice gratitude as part of your mindfulness as well. Often we get lost in the day to day grind, and forget that we can be truly blessed with simple things. Take the time to seek them out and look at them for all their glory and beauty. It’s easy to be upset you are not a millionaire, but it’s a lot harder and infinitely more helpful to be grateful you have a house and food. Part of this is teaching the process of just slowing down, so that you can interrupt anxiety when you start to feel it coming. That’s a key feature: you need to start doing something about it before it gets out of control. When you start feeling yourself breathing faster is the time to start relaxing and doing a meditative exercise. Using SOMA meditation and breathwork, you can successfully interrupt anxiety and panic, feel less anxious, and more centered in your daily life. If you are feeling anxious, and that is ruining your day-to-day life, it is time to reach out for some tools to help yourself. You do not have to live anxious every day. One of the key benefits you get from living a life less anxious is not seen as often. Anxious decisions are very rarely good, helpful or healthy. Anxious people will jump at any option that makes it go away, and those do not work out in the long run. Only when you are calm and focused, can you make healthy and helpful decisions in life for both you and your family. Anxiety and panic can seem dangerous to the person experiencing them, but they are not, and do not need to feel that way. Acknowledge them and learn the tools to feel less anxious daily, and in life overall. 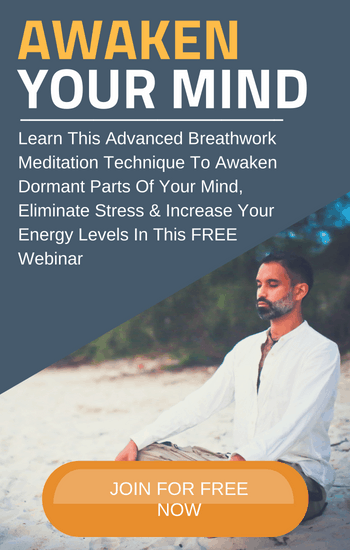 SOMA meditation and breathwork is a way to accomplish this goal and take back your life from anxiety and panic. You do not need to suffer from feeling anxious anymore.